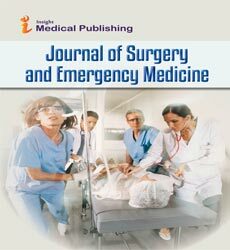 The aim of Journal of Surgery and Emergency Medicine is to publish peer-reviewed articles as quickly as possible. Journal of Surgery and Emergency Medicine focuses on the entire spectrum of the Breast reduction surgery, Bariatric Surgery, Breast Surgery, Colon and Rectal Surgery, Endocrine Surgery, General Surgery, Gynecological Surgery, Hand Surgery, Head and Neck Surgery, Hernia Surgery, Neurosurgery, Orthopedic Surgery, Ophthalmological Surgery, Outpatient Surgery, Pediatric Surgery, Plastic and Reconstructive Surgery, Robotic Surgery, Thoracic Surgery, Trauma Surgery, Urologic Surgery, Vascular Surgery, Minimally Invasive Surgery, trauma care, emergency service, acute medical care, rescue squad, cardiac catheterization, Napoleon Bonaparte's, Chest pain, Conduction disorders, Shortness of breath, Wheezing, Wheezing, Pleuritic chest pain, Acute bronchitis, Pneumonia, Pulmonary embolism, Foreign body aspiration, Lung cancer, Tuberculosis, Vision loss, Nasal congestion, Sore throat, Dental abscess, Glaucoma, Rash, Hypothyroidism, Diabetes mellitus, Coronary heart disease, Arrhythmias, Pain, Low back pain, Vertigo, Meningitis, etc. Journal of Surgery and Emergency Medicine publishes: case reports, state-of-the-art reviews, book reviews, clinical images, hypotheses and letters to the Editors. Comments on controversial issues and reviews of articles are also considered.